chocolate chip rosemary scones + eggsister's bridal shower! alright, we defrosted the princess cakes successfully and pulled off a super fun scandinavian woodland tea party bridal shower for eggsister!!!! we held it out in the woods behind our house last weekend and showered eggsister with love and giggles before it actually showered raindrops. organizing showers might be my new favorite hobby so i told eggsister and eggsisterfiancé this weekend at the twins game to get to werk on miniature humans asap so that i can plan a baby shower. 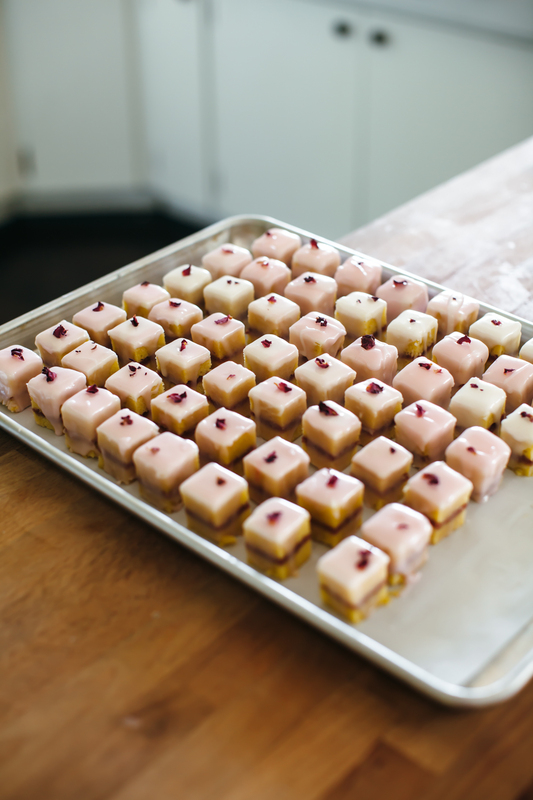 rose petits fours- from erin’s book which will be out this fall. they were so good and rosy and moist, that recipe alone would make buying her book worth it so go preorder it right this second (and zomg watch the trailer on her preorder page it's so hypnotizing and satisfying). a little woodland cake- vanilla cake with nutella frosting, decorated with crushed cookie "dirt," buttercream succulents, fresh rosemary, dala horse cookies, almonds, sprinkles, shaved rhubarb roses, a marzipan sign painted with food coloring, and marzipan mushrooms. yes, i went wild with the toothpicks to make sure everything stayed in place. chopped veggies with yogurt ranch- i’m putting that recipe in my yogurt book! my mom’s quiche! and i even used homemade pie crust (sarah’s crust!) the quiche recipe is on a super old newspaper clipping that my mom put in a homemade cookbook for me a long time ago, but one of our shower guests was asking for it so here it is: pre-bake a pie shell for 10 min at 375. combine these: 5 eggs, 1 1/2 c half and half, 1/4 tsp dry mustard, 1/8 tsp pepper, 1/16 tsp cayenne, 1/8 tsp nutmeg, 1/4 tsp salt, 1 1/4 c grated gruyere or swiss, 1 c finely chopped onion (softened in a skillet for 5-7 min), 8 strips bacon or 1/2 c ham. pour into pie shell, bake at 375 until set (begin checking for doneness at 45 min). rhubarb hibiscus tea- from shelly’s book and everybody loved it! it wasn’t too sweet and the color was such a pretty shade of pink that the clear glass bottles of it were like decorations themselves. here are some make-ahead tips in case you’re planning a shower: pretty much all of the sweet things could be made ahead. the princess cakes, cookies, and scones are able to be fully assembled and then frozen for up to a couple of weeks in advance. defrost in the fridge the day before and then bring to room temp the day of. i made the cake and the petits fours a few days before and stored them in the fridge. i prepped the sandwich fillings the day before and assembled the sandwiches the day of. and the quiche i also made the day before and then stored in the fridge until it was time for the party. for decorations, we referred to melissa’s book, scandinavian gatherings. that book is so stinkin cute. eggboy and i made the mushroom felt garland, the polymer clay mushroom sandwich picks, and the teacup terrariums using vintage teacups that have been in the eggfamily for generations. and eggboy made the tiered tree trunk stands from trunks in our yard! we also made flower crowns! we used pipe cleaners instead of floral tape since they were easier to distribute to all of the guests, but they came out so beautifully and convinced eggsister to have flower crowns at her wedding. our surprise decoration/activity was a homemade dala horse piñata. his name was bojack horseman. we made him a few weeks ago out of cardboard and a whole lot of packing tape (no need to do the paper mache thing, it turns out!) and hid him in a closet until the party. every so often we’d take him out and admire our work, which up close looked a little *rustic* but still we were really proud. i actually got kind of sad when it was time to whack him with a stick. luckily only his belly broke to let out all of the gummy bears and ring pops and the rest of him stayed in tact. no one except for little eleanor the flower girl went for the candy, everyone was sugared out. so our job was complete! here is the recipe that i used for the chocolate chip rosemary scones. they are a basic buttery scone that have been infused with fresh rosemary. i added a bit of orange zest too because i always feel like that helps accentuate the rosemary flavor in the way that espresso boosts cocoa and cinnamon boosts tahini. great aunt ethel said that these were the best scones she’s ever had! i’ll take it, especially from ethel because she is a baking queen. and like all things that i infuse with one herb, i suddenly want to try them out with other herbs. mint chocolate chip scones? basil chocolate chip scones???? preheat the oven to 400ºf. line two baking sheets with parchment and set aside. In the bowl of a food processor, combine the flour, baking powder, salt, sugar, and orange zest. pulse to combine. add the butter and continue to pulse until butter is pea-sized. pour the mixture into a large bowl and then add the chocolate chips. In a medium bowl, whisk together rosemary cream, egg, and vanilla extract. Add to the dry ingredients, and mix until just combined. Turn the dough out onto a surface dusted with flour and roll it out to 1" thick. cut out 2" circles using a biscuit cutter and place on baking sheets, 1 1/2" apart. bake until bottoms are lightly browned, beginning checking for doneness at 12 minutes. let cool for 10 minutes on the pan, then transfer to a wire rack. Combine reserved cream with the powdered sugar and a pinch of salt. Mix until spreadable (if it’s too thick, add a bit of water or additional heavy cream bit by bit until it’s spreadable). spoon the glaze over the scones while they’re still warm. enjoy! add the heavy cream and rosemary springs to a small saucepan. bring to simmer over medium high heat, then reduce heat to low and simmer for 15 minutes, stirring often. let cool then strain out the rosemary. store in the fridge until ready to use.